In late March, the Tennessee Hospital Association (THA) issued its 2017 Rural Impact Report, which found the state's 61 rural hospitals provided 15,654 jobs with a total annual payroll of more than $791 million. Given the rate of employment and associated revenue, the report's authors said rural healthcare could represent up to 20 percent of a community's employment and income. For Tennessee as a whole, the impact of rural hospitals resulted in $994 million for the state's economy. 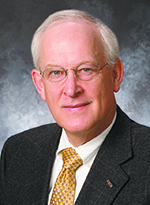 "Tennessee's rural hospitals are the cornerstones of their communities," said Craig A. Becker, THA president and CEO. "These facilities employ thousands of people and serve as major economic engines in their respective communities. In addition, they often are among the only options for rural residents when they need quality, affordable healthcare services." Tennesseans in rural areas are frequently older and more likely to suffer from a host of chronic conditions, such as diabetes, that often lead to additional complications. The report noted rural hospitals, which account for nearly half of the state's acute care facilities, provided almost $300 million in uncompensated care in 2015 (the most current data year) including $94.6 million in charity care. 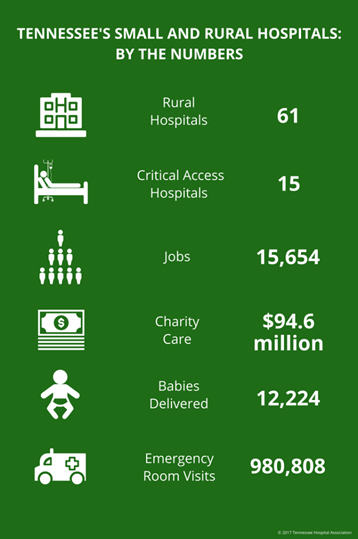 Additionally, the state's rural hospitals delivered 12,224 babies and accounted for 980,808 Emergency Department visits in 2015. In light of recent conversations regarding federal healthcare reform, rural hospitals could face more challenges when it comes to financial viability, which Becker said threatens the ability for facilities to continue providing quality care, especially when it comes to the uninsured and underinsured. Becker continued, "These facilities face a unique set of issues that are far different from their urban counterparts, such as the recruitment of healthcare providers and limited financial resources and capital. They're under a constant threat of potentially closing their doors, which would leave entire communities vulnerable." The report noted six rural hospitals have closed in Tennessee since 2014.